I have been steadily making a couple of 16 patch blocks every other day over the past week. Leaving it all for a couple of days and going back to it with a fresh perspective was a good idea. Reading other blogs has also been a great help, seeing how others approach things, & that they too experience that unsure feeling with what they are making. I also found this site which was interesting too... http://design-seeds.com/..... goes with my earlier thoughts of trying to get some kind of colour/mood picture happening to help me focus a bit better!!! The colours are kinda coming together slowly. Not sure if it's using an assortment of old/newer fabrics or whether it's the antique chintzie look or what, but there have certainly been a few rejects along the way! However, I decided to carry on, can't get despondant now, I'm well over 1/2 way! And then today...little Olive came to visit. Linking up with http://www.freshlypieced.com/ today. After spending time tidying up in the garden all morning I thought I'd relax with a bit of sewing. I'm working on my 16 patch quilt and, I must admit, it's been a bit tricky! I really thought I'd just combine fabrics, mainly greens & pinks, and things would be great!! Well, you know... there's many many different greens and many many pinks! It was suddenly beginning to look very shabby chic, not at all what I wanted!!! I needed to go back to my starting point. What I had in mind was a summer garden party....leafly greens/pinks/soft blues, with just a touch of something deeper...that's what I wanted! 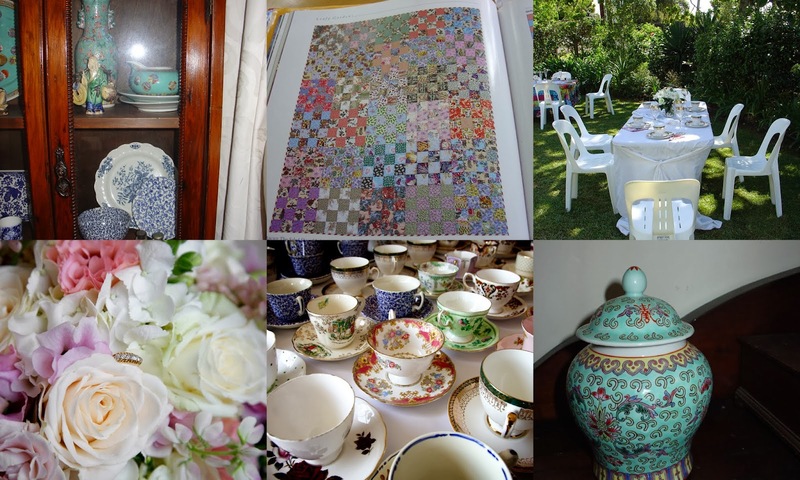 So to help, this afternoon I put together a few ideas - my collection of oriental pretties sitting alongside assorted blue & white china, mum's 80th "high tea" setting in her garden, my daughter's wedding bouquet, my mis- matched cups & saucers, and of course the quilt that started all this!!! A kind of mood board, I guess? I have been going thru' a few of my Kaffe Fassett books this week, and certain quilts still have appeal. I spotted a "crosses" quilt made in a rich pallette of gold/magenta/blue tones, and more modern versions of this have popped up often over the past year. Another "oldie but a goodie" is the ever popular Rosy quilt, 9 Patch square alternating with larger squares in a variety of colour combinations, leafy rosy/tawny rosy/pastel rosy. Kaffe & Brandon are "in town" this weekend in Auckland, NZ. I recently found this blogsite, http://oops-lah.blogspot.co.nz/ , where Vrena had just finished one of his classes, check it out for interesting comments. I went to a Kaffe class a few years ago, really enjoyed it. The main things I got from the day were to focus on colour rather than the print, use a design wall, and to work fast & intuitively! Of course things still don't always pan out, wrong choices of fabrics, etc. (I wonder how he copes with that?). 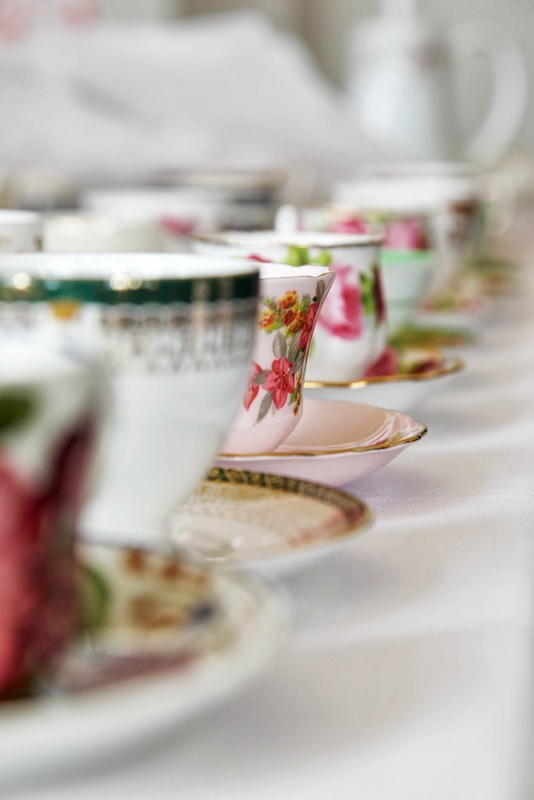 What springs to mind when I think of Kaffe is his bold use of pattern & strong colours. In one of his earlier books however, published in 1997, I found a quilt that I really liked, a version of the 16 patch quilt. I have recently made a 16 patch quilt, and while it was quick to piece, it was made from solely from one designer range. A bit limiting I felt. ........interestingly, in this old book, he hadn't yet begun to design his own fabric ranges. I figure this v.versatile quilt block was the perfect answer to using up some of my assortment of old/new fabric scraps, from a variety of sources, over a period of years! I just need to stay focused on the colours & not get sidetracked by the prints!! This is where I was at when little Olive (nearly 3yrs) came to visit the other day. She took one look at all the blocks laid out on the spare bed & she just so so wanted to play !!! Luckily, we were off out to "the cafe" !!! So today while it rained, I had a final audit/play with the placement of my hour glass blocks!! ...I shifted things around a wee bit to ensure the top & the bottom rows were sort of mirror images of each other, something I have found in the past helps keep a bit of balance happening in a scrappy sort of quilt! ...and I replaced some of the teal triangles with a more deeper blue fabric to give more variety. These large blocks went together v. easily, a little bit of pinning to interlock everything nicely, & all intersections looking ok for once!!! Linking up with WIP Wednesday over @ http://www.freshlypieced.com/ later on today. Beginning a new quilt was the last thing on my mind today, but hey...and once I stepped into the spare room to open the curtains, my Sunday morning just disappeared!!! This week I have been concentrating on a few of my unfinished bits & pieces. I decided that before I begin any other quilts I have to finish at least one!! Like many of you, I do have a few ideas running around in my head - but they will have to wait. My personal tastes have changed over time and I admit some WIP's have really & truely lost their appeal now e.g. those jewel coloured tumbling blocks are certainly going back into the depths of the wardrobe!!!! But, I did get up to speed with the Material Obsession's "40 Shades of Grey" BOM homework. The next block is sure to arrive any day!! I guess we must be at least 1/2 way thru' by now, I think it was for 10 mths total. And in the evenings, I have made some more progress on my scrappy Tumbler Quilt. I pieced it together some time ago (pre blogging- time!!) and am now hand quilting, 1/4" outlining each tumbler using perle cotton. I do really enjoy quilting by hand & use to do it alot more years ago, but time pressures/work etc intervened. The finished effect is lovely & soft, quite different to machine quilting. But it does takes some time! All in all... a good few days of summer sewing! I wanted to try & link up to Freshly Pieced WIP's, not too sure how to do this yet but will try!! I'm just a wee bit technically challenged, wish me luck!!! update.... http://www.freshlypieced.com/ hey..it worked !!!! I have been waiting for this book for simply ages...and today it finally arrived!!!! 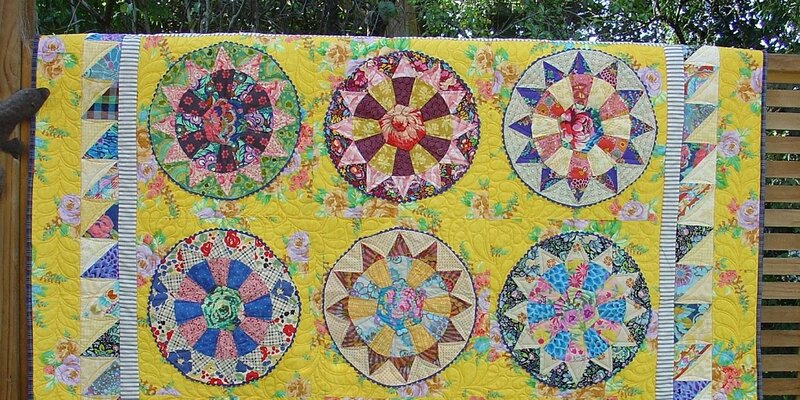 Vintage Quilt Revival by Katie Clark Blakesley, Lee Heinrich & Faith Jones. It has instructions for making 20 traditional blocks, nothing startling there! However, I was more interested in the way the authors gave the old blocks a modern spin & show some fresh quilt layouts & new colour approaches. I think the versatility of classic blocks is really captured here! I love this comment in the introduction on discussing the end product, you know - our completed quilt, warts & all ...... (quote) "remember - there is something inherently beautiful in the imperfection of a handmade item". Embrace the skill building moments as they come" (unquote). * There is also a quilt-a-long happening, check it out over on this site - http://sukiedontyaknow.com/2013/12/vintage-quilt-revival-block-along/ This is all set to start January 21st. * And a blog hop @ http://filminthefridge.com/ where everyone is each making an individual block & they will end up as charity quilts. Great idea! Thanks to everyone who has stopped by & for all your lovely comments over the past year!!! 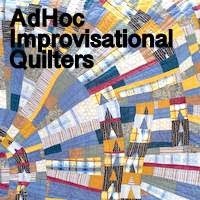 If you've just found Kokaquilts for the first time, welcome! And Olive just loved her little mermaid dolly on Xmas day!! I have had a lovely relaxing few weeks down at the beach...swimming, walking, dress shopping @ Molly's (!! ), and eating out at the various cafes, etc. The high influx of people into the area meant that the main road was just like rush hour all day!!! Luckily this last week it all quietened down a bit. Yesterday I went searching in the wardrobe for a particular fabric, (for something quite unrelated to patchwork!). One would think that now I have a bit of a system happening with my fabric stash that I should be able to lay my hands on something easily, but no such luck!! On going thru' the depths of the now sewing room wardrobe, what I found instead was this sweet little unfinished quilt top. Kaleidoscope blocks using Kaffe stripes with softer pastels & a couple of batiks thrown in too. There's a kind of circular- motion- thingy happening, where alternate blocks have the lights & darks reversed. I remember seeing a version of this quilt in a book by Alex Anderson, only she paper pieced it, whereas I drew up the triangles on graph paper & machined pieced them. And, on a closer inspection of my earlier piecing, it's all looking pretty good...the intersections are almost perfect!! I fished out some circus fabric which teamed up well for the backing & layered the quilt up ready for some simple machine quilting. The other thing I found was a lovely old unfinished quilt top - of my version of the Cotswald's Quilt, a large medallion quilt, using reproduction fabrics. This quilt top is an old UFO, and has been sitting in my wardrobe for well over 8 years now. I purchased the pattern from Patchwork on Stoneleigh in Australia. I remember that I had a spot of bother with the one of the borders, just couldn't get it to fit, so I abandoned the project. Looking at it again now, I am so sure I could make it work.... my 2014 motto - if it doesn't fit, make it!!! I still love this kind of look, with it's faded creams & repro colours, where nothing looks like it was bought specifically but rather collected over a few years, & seems kind of unplanned. What's more, I also had all the other bits cut ready for the flying geese borders, & some were even pieced as well! And there seems to be all the bits cut ready for the next final four simple borders. So sadly, this lovely beginning of a quilt never came to anything - yet!!! But I can understand how this happened. Around this earlier time in my life, after a short 3yr stint owning a patchwork shop & earning nothing/ziltch/nada/zero/nil, I concentrated on getting back into full time work. Nursing became a priority and in the process, all things patchworky kinda stopped in my life for quite a few years. Anyway now, re-discovering all these old goodies in the depths of the wardrobe is simply wonderful!! AND with everything all cut & ready to go, I've got no excuse not to just get on & finish this!! But I am selective on what I will work on & actually finish!! This final UFO is old, from way way back! Tumbling blocks, all in jewel type colours with mainly black inbetween. I have two largish segments, all hand pieced, and I truely don't know what to do with them now !! !